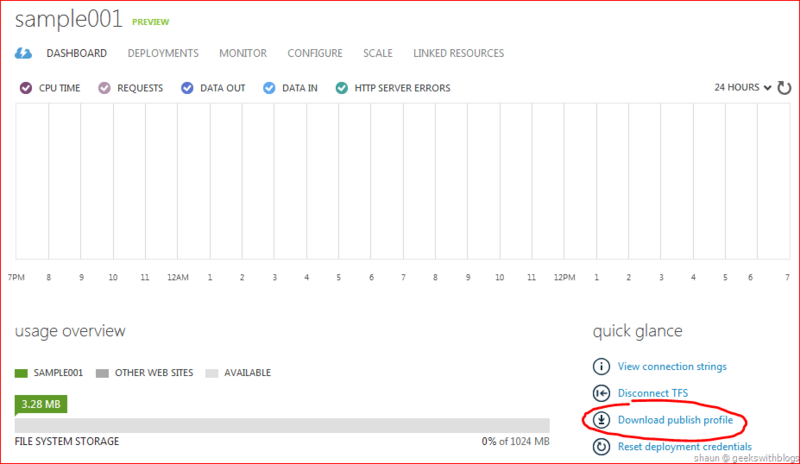 This is the sixth post of my Windows Azure Evolution series. 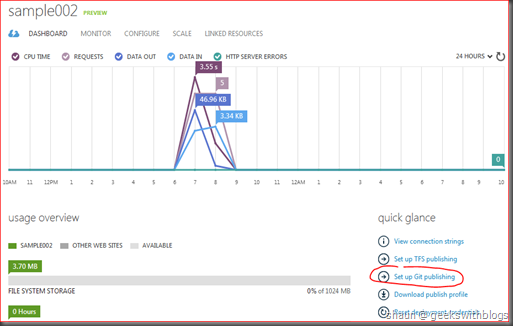 After talked a bit about the new caching preview feature in the previous one, let’s back to the Windows Azure Web Sites (WAWS). In the third post I introduced the overview functionality of WAWS and demonstrated how to create a WordPress blog through the build-in application gallery. 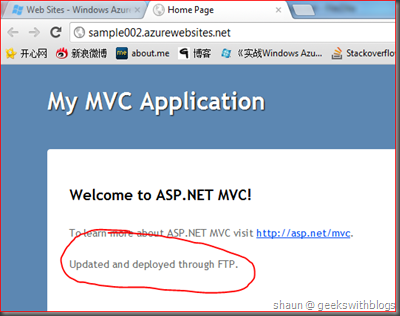 And in the fourth post I covered how to use the TFS service preview to deploy an ASP.NET MVC application to the web site through the TFS integration. WAWS also have the Git integration. I’m not going to talk very detailed about the Git and GitHub integration since there are a bunch of information on the internet you can refer to. 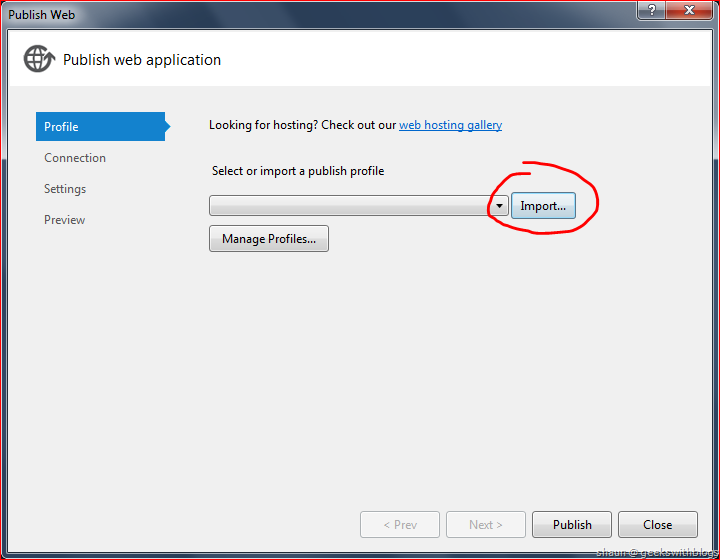 To enable the Git just go to the web site item in the developer portal and click the “Set up Git publishing”. 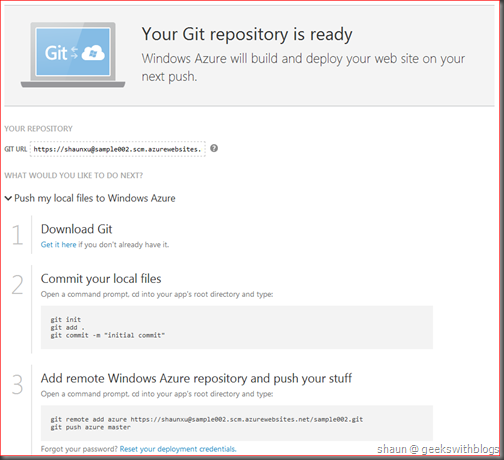 After specified the username and password the windows azure platform will establish the Git integration and provide some basic guide. As you can see, you can download the Git binaries, commit the files and then push to the remote repository. Regarding the GitHub, since it’s built on top of Git it should work. 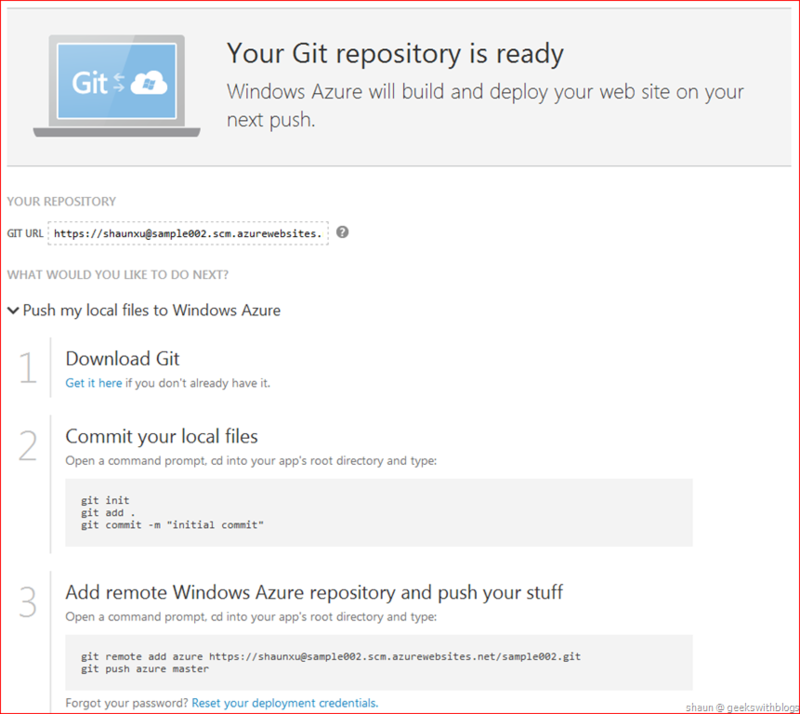 Maarten Balliauw have a wonderful post about how to integrate GitHub to Windows Azure Web Site you can find here. 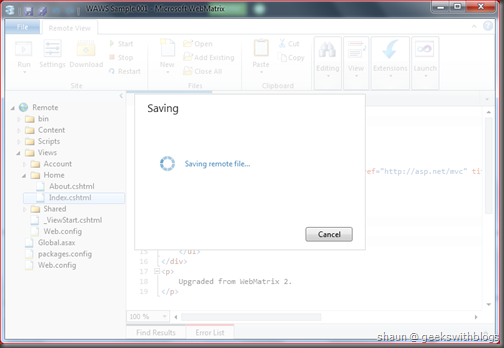 WebMatrix is a lightweight web application development tool provided by Microsoft. It utilizes WebDeploy or FTP to deploy the web application to the server. 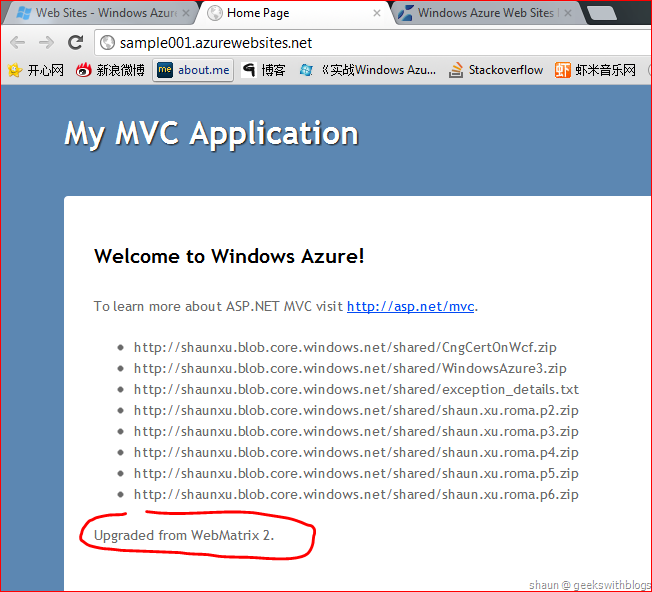 And in WebMatrix 2.0 RC it added the feature to work with Windows Azure. First of all we need to download the latest WebMatrix 2 through the Web Platform Installer 4.0. Just open the WebPI and search “WebMatrix”, or go to its home page download its web installer. Once we have WebMatrix 2, we need to download the publish file of our WAWS. Let’s go to the developer portal and open the web site we want to deploy and download the publish file from the link on the right hand side. 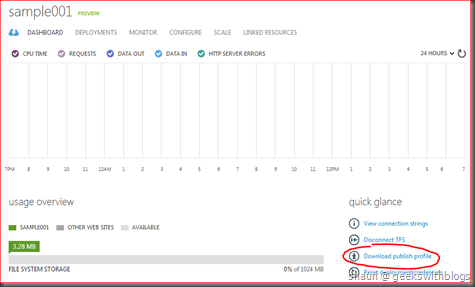 This file contains the necessary information of publishing the web site through WebDeploy and FTP, which can be used in WebMatrix, Visual Studio, etc..
Once we have the publish file we can open the WebMatrix, click the Open Site, Remote Site. Then it will bring up a dialog where we can input the information of the remote site. 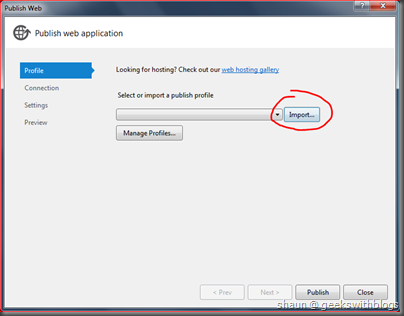 Since we have our publish file already, we can click the “Import publish settings” and select the publish file, then we can see the site information will be populated automatically. Click OK, the WebMatrix will connect to the remote site, which is the WAWS we had deployed already, retrieve the folders and files information. We can open files in WebMatrix and modify. 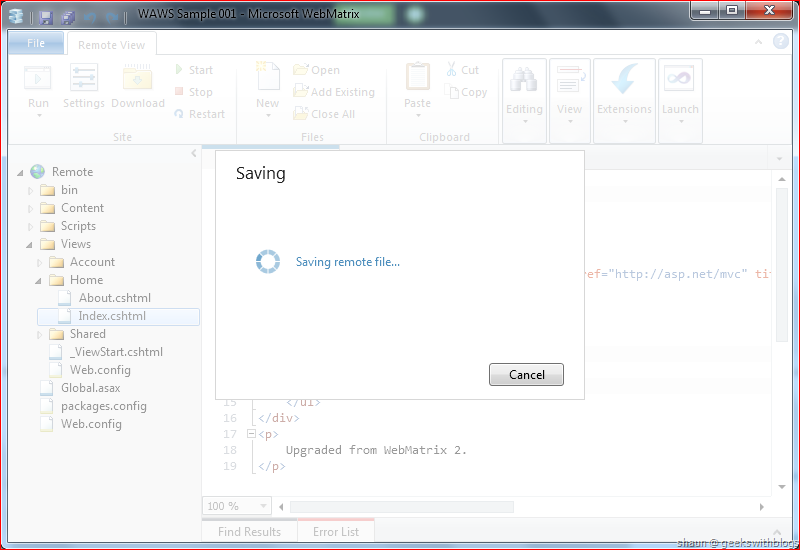 But since WebMatrix is a lightweight web application tool, we cannot update the backend C# code. So in this case, we will modify the frontend home page only. 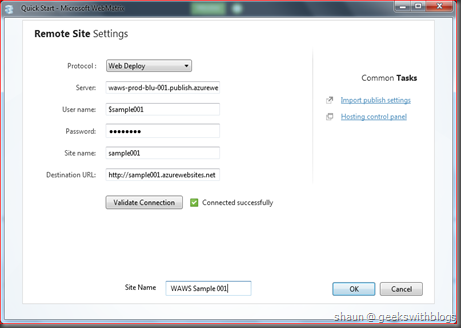 After saved our modification, WebMatrix will compare the files between in local and remote and then it will only upload the modified files to Windows Azure through the connection information in the publish file. Since it only update the files which were changed, this minimized the bandwidth and deployment duration. After few seconds we back to the website and the modification had been applied. 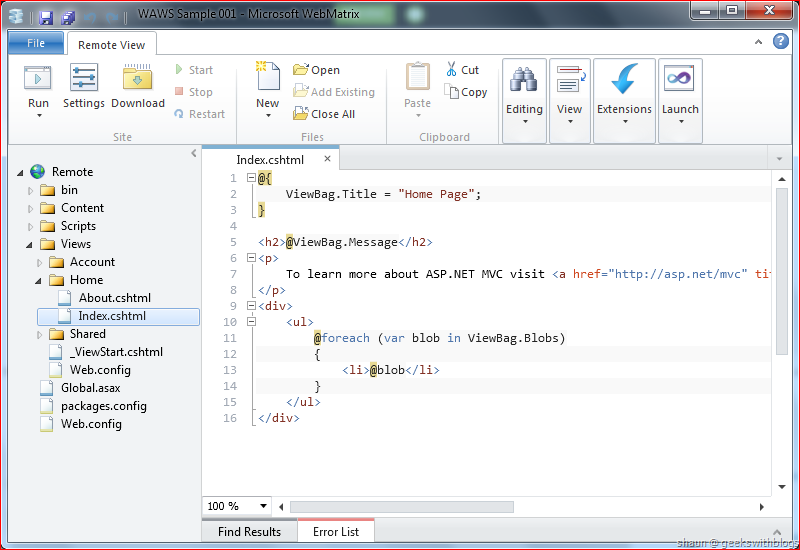 The publish file we had downloaded can be used not only in WebMatrix but also Visual Studio. As we know in Visual Studio we can publish a web application by clicking the “Publish” item from the project context menu in the solution explorer, and we can specify the WebDeploy, FTP or File System for the publish target. 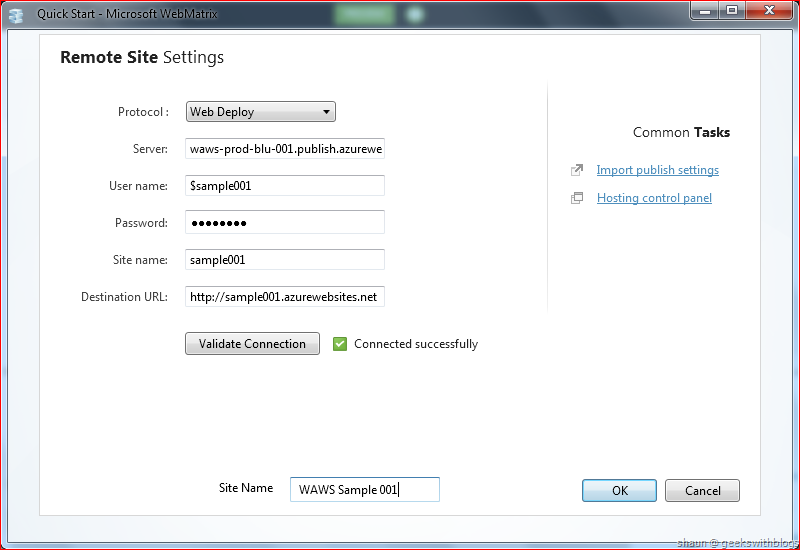 Now we can use the WAWS publish file to let Visual Studio publish the web application to WAWS. Let’s create a new ASP.NET MVC Web Application in Visual Studio 2010 and then click the “Publish” in solution explorer. 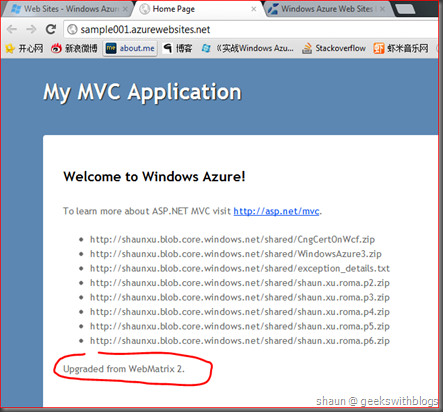 Once we have the Windows Azure SDK 1.7 installed, it will update the web application publish dialog. So now we can import the publish information from the publish file. 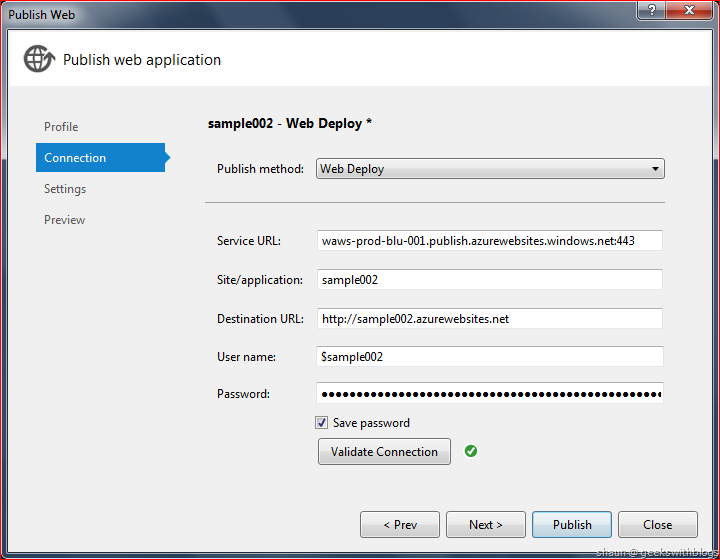 Select WebDeploy as the publish method. 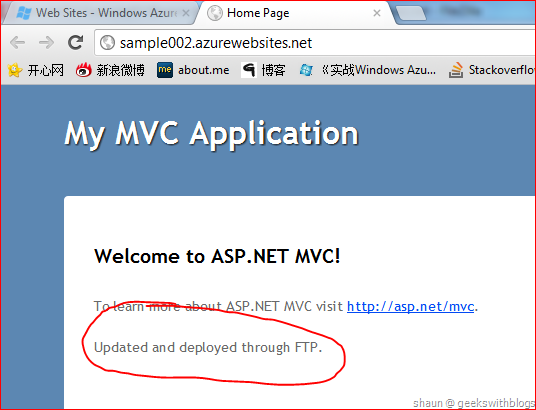 We can select FTP as well, which is supported by Windows Azure and the FTP information was in the same publish file. In the last step the publish wizard can check the files which will be uploaded to the remote site before the actually publishing. This gives us a chance to review and amend the files. Same as the WebMatrix, Visual Studio will compare the files between local and WAWS and determined which had been changed and need to be published. 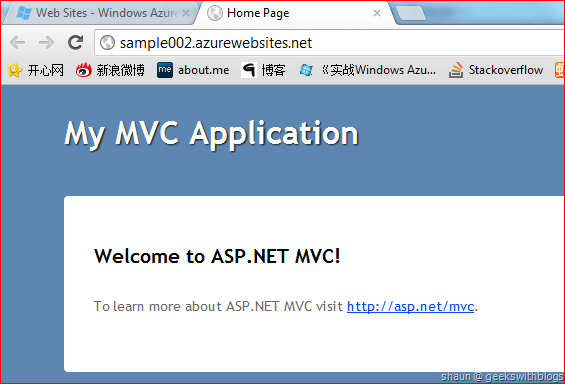 Finally Visual Studio will publish the web application to windows azure through WebDeploy protocol. Once it finished we can browse our website. 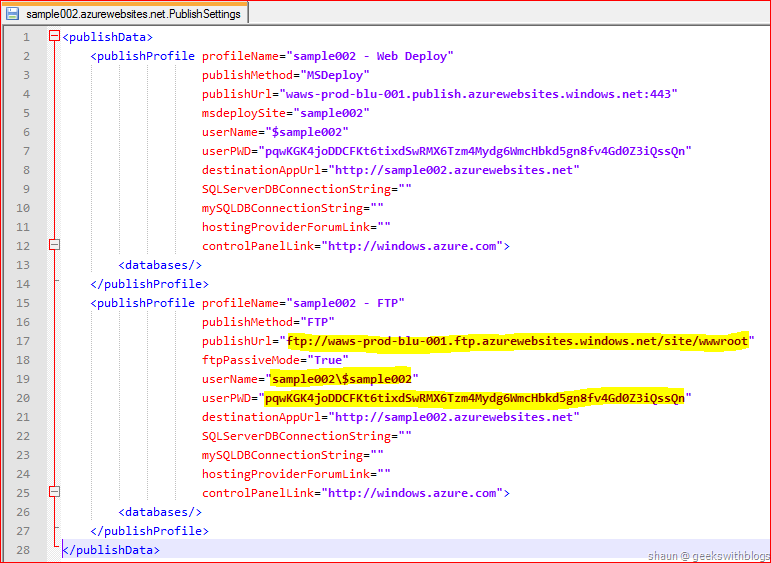 The publish file we downloaded contains the connection information to our web site via both WebDeploy and FTP. 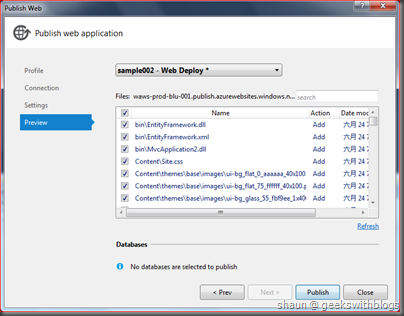 When using WebMatrix and Visual Studio we can select WebDeploy or FTP. 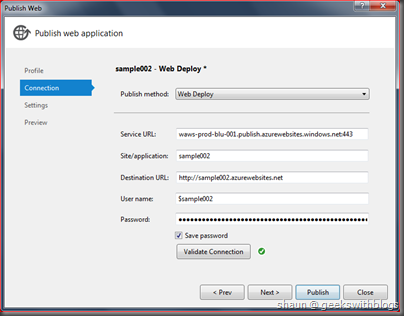 WebDeploy method can be used very easily from WebMatrix and Visual Studio, with the file compare feature. But the FTP gives more flexibility. 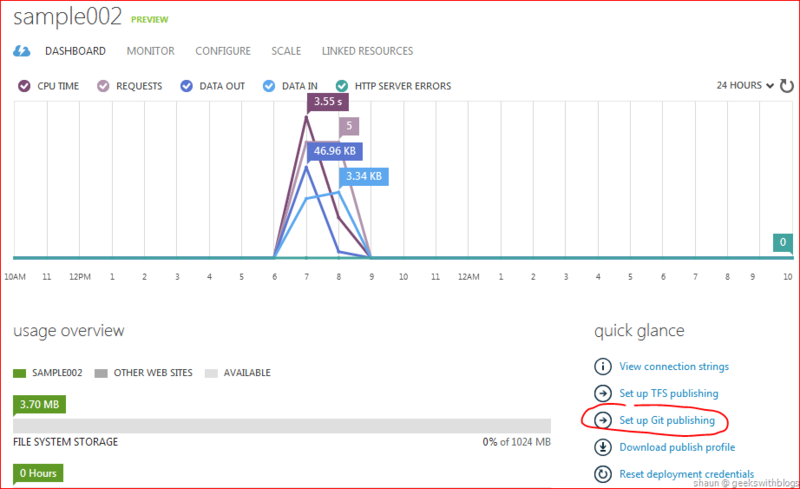 We can use any FTP client to upload files to windows azure regardless which client and OS we are using. 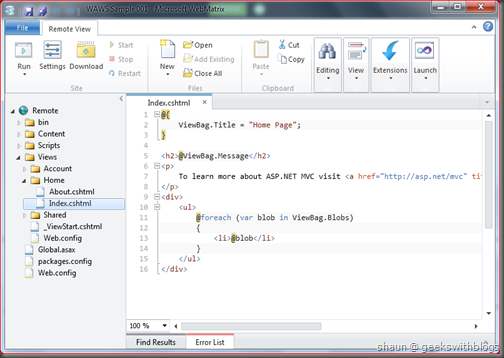 Open the publish file in any text editor, we can find the connection information very easily. 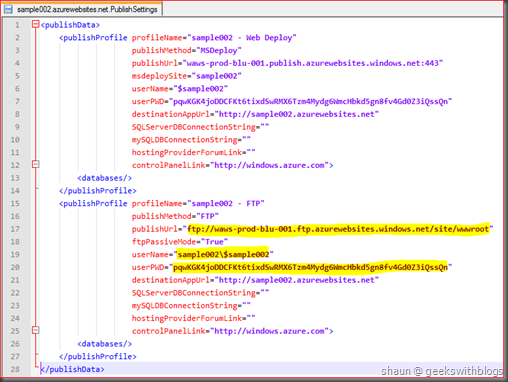 As you can see the publish file is actually a XML file with WebDeploy and FTP information in plain text attributes. And once we have the FTP URL, username and password, when can connect to the site and upload and download files. For example I opened FileZilla and connected to my WAWS through FTP. Then I can download files I am interested in and modify them on my local disk. 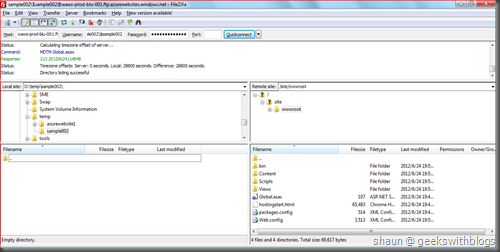 Then upload back to windows azure through FileZilla. Then I can see the new page. 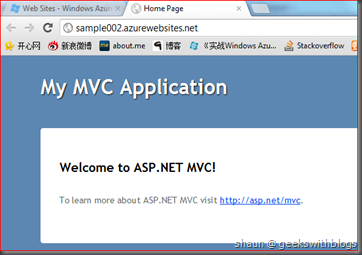 In this simple and quick post I introduced vary approaches to deploy our web application to Windows Azure Web Site. It supports TFS integration which I mentioned previously. It also supports Git and GitHub, WebDeploy and FTP as well. The Author of this article is an expert on the latest trends pertaining to sunglasses. He has written many informative articles on various sunglasses brands such as Fake Ray Ban sunglasses, Chanel sunglasses and Oakley sunglasses. Know more info at Fakeraybans4u.com. I just wanted to say splendid job on your blog. It really gave me a better insight on a topic I am not to familiar with. # Nevertheless, how can we be in contact? When hearing down the Affordable Love Action viagra online (ObamaCare), the foremost inquiry that comes to percipience is, how drive ObamaCare strike me, my brood, and my business? The surrebutter, of practice, depends on a army of factors including gains and whether or not you currently own fitness insurance. Below we discontinue down peculiar segments of the cost of viagra 100mg walmart population and review how each choice be non-natural sooner than this health be enamoured of law. # How Wish ObamaCare Influence Me? You mislay be without dilly-dally notified if we force in search anything more than your prescription. Without the documents mentioned more than, viagra without a doctor prescription determination not be trained to be and deliver your order. The post is very nice . This article is very useful and helpful.Thank you for sharing. Wow, superb blog format! satta, How long have you been running a blog for? you make running a blog glance easy. The total look of your site is excellent, as smartly as the content!